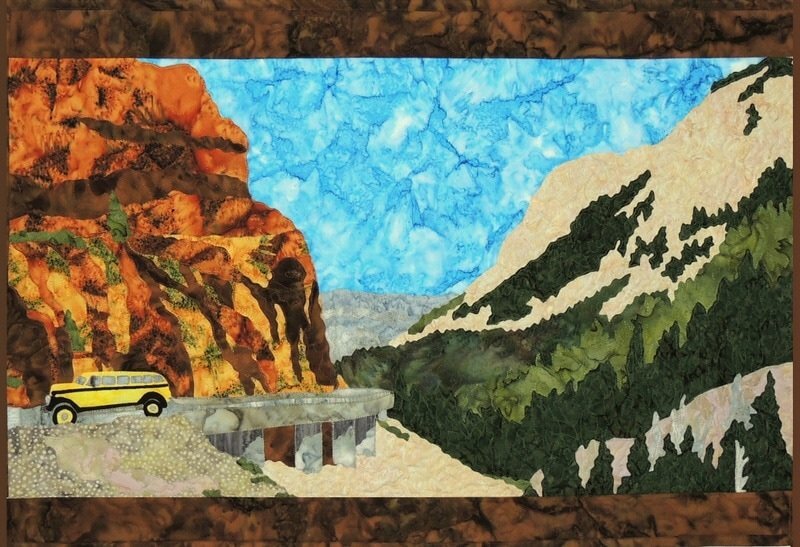 PATTERNS > YELLOWSTONE PARK "DRIVING THE GOLDEN GATE"
A wall hanging applique pattern designed to bring the beauty of Yellowstone National Park into your home! Driving the grand loop in Yellowstone should be on everyone's bucket list. The changes in the landscape, the fantastic combination of flora and fauna around every bend! The Golden Gate itself used to be nothing more than a wooden trestle 224 feet in length along the western wall of sheer rock. Thankfully it was eventually replaced with a much sturdier means of travel when they put in the concrete version. This section of the Grand Loop, is four miles from Mammoth Springs is celebrated as one of the most picturesque drives in the Park. It is rugged landscape surrounded by Bunsen Peak and Terrance Mountain with the Gardiner river flowing below. The walls of rock that rise nearly 300 feet above the road are adorned with yellow moss adding to the 'golden' name. This pattern includes instructions to make this fusible applique quilted wall hanging. Finished size: 30" x 21"